Unmapped Country: What's Success Got to Do With It? What's Success Got to Do With It? Honestly, I’m far too scattered to share anything profound. I'm thinking in lists, not paragraphs, in small units, not abstractions. Hanukkah, Christmas--Christhanakwanzika, as the DJs on 92.3 FM refer to the festivities that have engulfed me—have engulfed me. What’s a nice Jewish girl to do? Drive two hours for a ham, what else? And an hour for the 8th grader to spend some quality time with her bestest friend, which is what happens if your child goes to private school and not to the local public school. And soak the glasses, mugs and cutlery in a vinegar-dishsoap-water mixture to remove the hard-water rime from them. And go to CVS three times, each time forgetting the annual Toblerone for the husband’s stocking. And hand-grate the potatoes for the latkes because the grater attachment for the Cuisinart is broken—which I forgot, since the only time I use that attachment is to make latkes, and the only time I make latkes is once a year. 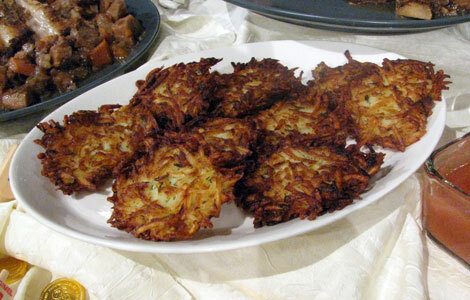 Last year, I made so many latkes it was wondrous. And then, two weeks after Hanukkah, which must have been Christmas, I opened up the oven to put in something (the goose?) and discovered a full platter of gorgeously browned two week old latkes. Okay, no, I didn’t. But it hurt to throw them out. Do a few minutes of yoga every morning so you don’t turn into a two week old latke that crumbles instead of bends. Drive the Prius to the ham and the bestest friend and use the time for some isometric abdominal exercises, since there is no time for the gym. Walk the dog for some nice, fresh, suburban air and wonder, dispassionately, if this will be the year the tree falls over. It's listing to the left, just a little. And let me pass on my accountant’s take on success, since she shared it with me and the husband yesterday: That success is doing what makes you happy. 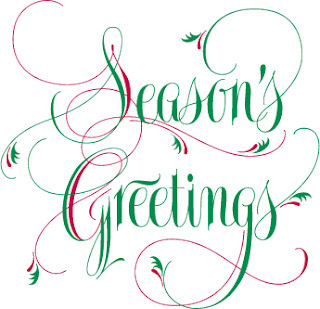 What are your scaled back goals for the holiday season? I had to chuckle about your CVS trips. I'm always forgetting the one thing I went to get in the first place-this time of year plays tricks with the mind. I chuckled some more about the tree. Every year I figure it has to fall down, or start on fire, but somehow it works out. As for goals, well, I'm keeping them small too, listy, one thing at a time. Still working on gifts, so that will gradually get done the next few days. I have an overdue book, The Art of Fielding, and I have to finish it-only about 50 pages left-fantastic book by the way. Other than that, I'm trying to keep myself without goals for the time being, until New Year's anyway, when inevitably goals will foist themselves upon me. Glad to amuse, Tim! That's a plus. so far, the tree stands. Goals: a peaceful, joyful holiday without too many expectations; a beautiful meal that is as fun to prepare as it is to eat; rest; yoga; writing. Thanks, Mrs. Hap. Cheers to you and yours! I sat up straight at "Reader, I ate them." Reminded me of my pan of burnt Christmas brownies two years ago that I couldn't toss. So I nibbled around the inedible charcoal until I felt less guilty about tossing it. Then the hubby burned last year's Thanksgiving turkey, and again I felt compelled to salvage as much as I could. If only replacing the 20-yr-old oven were a small goal. I was also laughing at "Reader, I ate them." But since I SO would have eaten them myself, I felt a bit jealous at your self-control. The mold would have to be quite visible or they'd have to smell pretty darn funky before wouldn't rationalize my way into "saving perfectly good food." And I love your accountant's definition of success! @Scrollwork, THAT reminds me of how I'd save all the bad stuff in my Halloween bag, stuff I shouldn't eat, like homemade cookies, and nibble at the edges of them when they were totally stale and everything else was gone! @Crabby, I am too afraid of food poisoning to eat something so old and unrefrigerated! Guess What Stephen Covey Suggests?